A tree-inspired primary school embraces nature-infused learning in France. 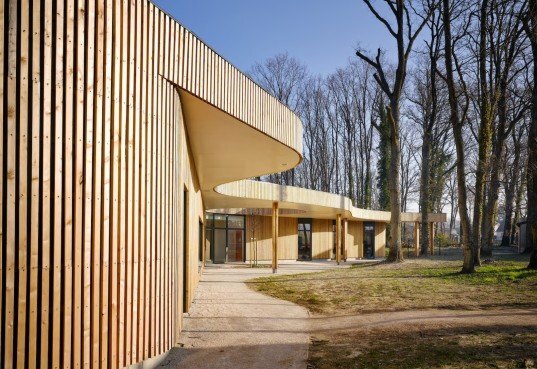 Paris design firms MU Architecture and Archicop designed the timber-clad school with an organic shape that winds between trees in the French commune Briis-sous-Forges. Full-height glazing fills the green-roofed school with natural light and frames views of the surrounding woodland. Created to provide after-school and summer school facilities for young children, the school heavily references its surrounding environment. The curvaceous facade is clad in strips of vertical battens of larch left untreated to mimic the trunks of the woodland landscape. Like a crown of leaves, a green roof tops the structure and extends outwards to shade walkways and courtyards. Circular openings punctuate parts of the roof to allow trees to grow through the center. The building plan branches out in three directions. The central node is mostly clad in glass and contains the reception area and small garden. “The imposing presence of the forest on the site has always been a leading point to our design,” Grégoire Dubreux, Associate Architect at MU Architecture, told Dezeen. 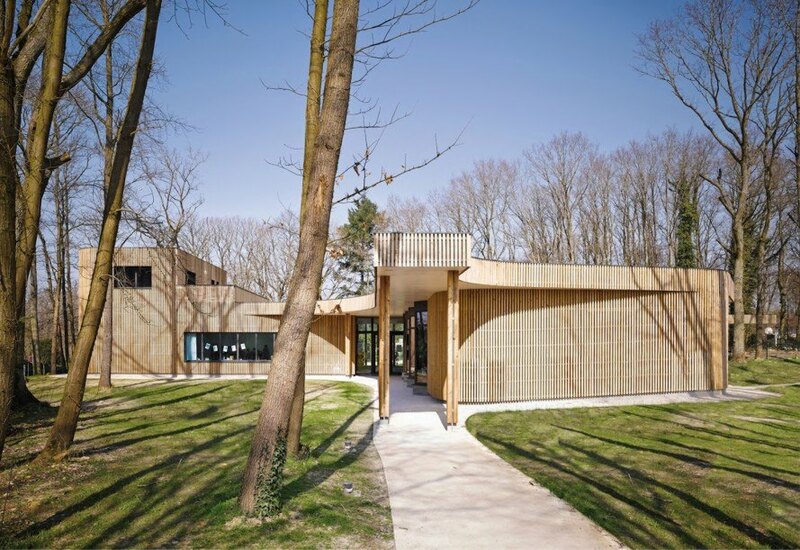 “On one hand, we defined the shape and the implantation of the building with the rhythm and the density of the trees, and on the other hand we interpreted the forest vocabulary like the reinterpretation of the clearing, with the softness of the curves, the raw material, the brown colours and the green roof.” In addition to classrooms and play areas, the building includes a small low-income residence accessible via an external staircase. The curvaceous facade is clad in strips of vertical battens of larch left untreated to mimic the trunks of the woodland landscape. Like a crown of leaves, a green roof tops the structure and extends outwards to shade walkways and courtyards. The building plan branches out in three directions. The central node is mostly clad in glass and contains the reception area and small garden. In addition to classrooms and play areas, the building includes a small low-income residence accessible via an external staircase.